As soon as you can make ‘Opening A’ you can ‘Cut the hand’ and ‘Saw’ together. 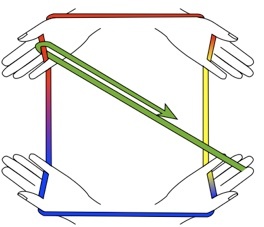 This figure consists of making ‘Opening A’ twice (Opening A is the name of a very common beginning), getting a friend to place a hand through and releasing a few strings. 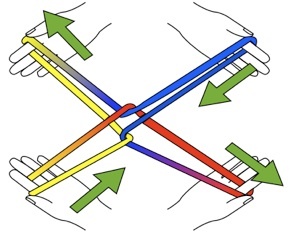 Start by placing the strings on thumbs and little fingers as shown. 1. 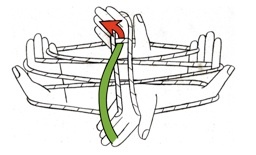 Right index takes left palm string from below. 4. Tell hand “Go down middle.” Drop all except thumbs. 2. 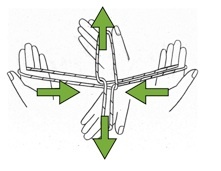 Left index takes right palm string from below in middle. 9. Drop all except thumbs. 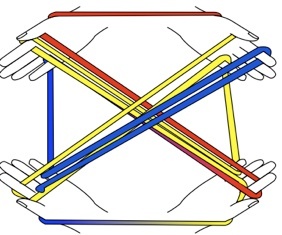 This figure consists of making two people making ‘Opening A’, releasing all but index fingers and ‘sawing’ together. 1&2. Place string on thumbs and little fingers as shown. Make Opening A with right hands. 3&4. Make Opening A with left hands. 5&6. Drop all except index. Start “sawing” (clap left, then right). 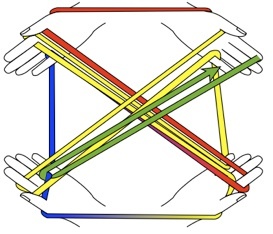 This figure consists of making two people making ‘Opening A’ with each other, releasing all but index fingers and ‘sawing’ together. 4. 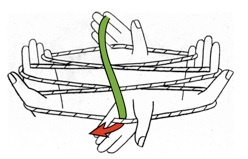 Second player takes framing strings with thumbs and little fingers read to make ‘Opening A’ on top. 5. 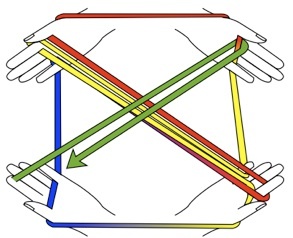 Second player’s right index takes own left palm string. 6. Second player’s left index takes own right palm string. 7. 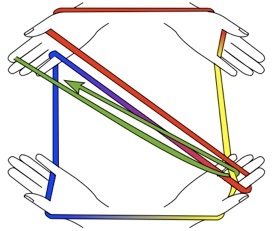 Second player’s right index takes own left palm string. 8. Second player’s right index takes own left palm string.